BCA automatic transmission rebuild kits and parts help take the guesswork out of your auto transmission repair or rebuild. 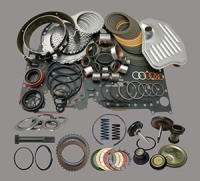 We put together all the pieces and parts you might need right here so you can find both the individual parts and convenient complete kits including transmission bands, clutches, gaskets, seals and filters. Our kits help put the life back into your automatic transmission whether you are doing a stock or all out performance rebuild. If you don't see it listed, it's coming soon so keep checking back!